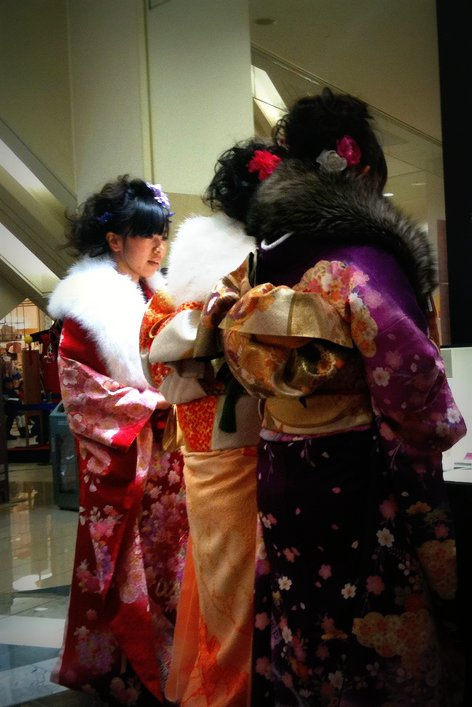 Japanese young women wearing expensive Kimonos litter the streets. There is an excitement in the air as young people smile and celebrate together in public places. People who have just turned 20 or are to turn 20 (official age of adulthood: smoking, drinking, and gambling are now legal activities) by the end of the school year take part in the celebration. On this day, there is an official ceremony held by each city for these new adults. As a tradition many afterwards, go to the shrines to offer prayers for their future. The rest of the day they go out and gather with friends, usually in public. It is a reminder to many of the important and special transition to adulthood in Japan. Very different from the west, Japanese culture has very sudden points of clear transition in life. This is just one example. One day you are a youth, the next day you have a celebration, and now you are a full fledged adult. However, the process of maturity is nowhere near that simple in real life. It draws similarity to the Bar Mitzvah in the Jewish culture, or the Quinceañera in the Latin American culture. Seijinshiki, the Coming of Age Day, another unique beautiful part of the Japanese culture. I am very happy to read your articles, especially about the Japanese culture. OK.. so Japan is a trip! Fried chicken on Christmas and now this? What is next? Thanks for letting us see this culture through your eyes! Japanese culture is fascinating. So traditional on one hand, and modern on the other. I've once read about the coming of age ritual in Eiji Yoshikawa's Taiko. If I'm not mistaken, little Hideyoshi's was coming of age and his mother shave the hair above his forehead, and then there's another ritual involving some rice but I couldn't remember it clearly. That's the only thing I know about coming of age tradition in Japan.